Entertainment Launch: New Book, ‘The AutoThugOgraphy’ of Turk, a Memoir by ‘Hot Boy Turk’ Virgil Jr. 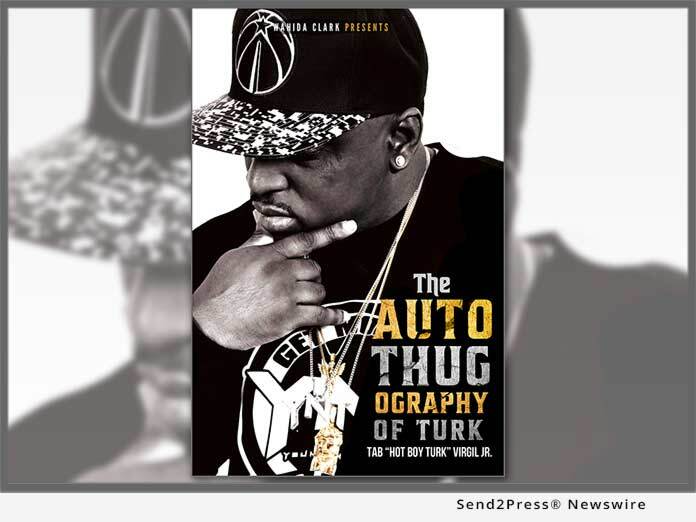 Launch: New Book, ‘The AutoThugOgraphy’ of Turk, a Memoir by ‘Hot Boy Turk’ Virgil Jr. The Oracle Group International announces Former Cash Money Records artist Tab "Hot Boy Turk" Virgil Jr. takes you on a journey of deep spiritual and mental growth in his new book, 'The AutoThugOgraphy of Turk' (Hardcover: Wahida Clark Publishing: ISBN: 978-1947732216). The Oracle Group announces Former Cash Money Records artist Tab "Hot Boy Turk" Virgil Jr. takes you on a journey of deep spiritual and mental growth as he reveals how he dealt with the struggles of growing up in the infamous New Orleans' Uptown Magnolia Projects, his heroin and cocaine addiction, his incarceration, and how he survived the challenges thrown his way with pure grit, tenacity, and the unconditional love from his family in his new book, "The AutoThugOgraphy of Turk" (Hardcover: Wahida Clark Publishing: ISBN: 978-1947732216). Cash Money founders Ronald "Slim" Williams and Brian "Baby" Williams discovered Turk while he was rapping in Magnolia Projects in 1996. Soon after, Turk was recruited as one of the original members of the now-defunct late 90's group "Hot Boys" crew alongside Juvenile, B.G. and Lil Wayne. Being the biggest draw on Cash Money Records back then, the Hot Boys gained international success and went on to create timeless music as a group, as well as individually. His first ever solo debut "Young and Thuggin'" was released under Universal Records in June 2001. His second solo album "Raw and Uncut" under Koch hit the streets in 2003, before he was charged with second-degree attempted murder after a drug raid shootout in Memphis, Tennessee. The then up and coming rapper's life took a turn after police claimed that he shot an officer during the drug raid, but Turk holds firm that he hid in the closet unarmed. His third album Penitentiary Chances came out in 2004 while awaiting trial in prison. Turk's sentence finally ended after 8 years, 8 months and 16 days on October 12, 2012. Virtually unstoppable since his release, Turk's first project after life in prison, "Blame It On The System" reminded everyone that he is a force to be reckoned with. He has since been consistently doing interviews and appearing on different shows and media outfits, making new music, and has even started his very own label, YNT Empire. Picking up where he left off before prison, Turk is ready to take the world by storm, and hopes to inspire others who are in the brink of giving up: "It's a tell-all book. I'm letting the world know my story," says Turk, "I'm ready for all of you to know the real me." According to Turk, this is so people could see beyond the former Hot Boy from Cash Money and get to know the real Turk who triumphed over the challenges he faced in his career, as his well personal life -- from his post-incarceration trauma, his loyal wife Emani's struggle to keep it together after kids and surviving cancer, and much more. Tab "Hot Boy Turk" Virgil Jr. Born and raised in New Orleans Uptown Magnolia Projects, Turk was initially an aspiring football player before developing his passion and ability for rapping. He joined the ranks of Cash Money label-mates Juvenile, B.G., and Lil Wayne back in 1996 as one of the original Hot Boys crew members. In 2003, he was charged with second-degree attempted murder after a drug raid shootout in Memphis, Tennessee and was incarcerated for 8 years, 8 months and 12 days. He founded the music label YNT Empire.